Being productive at work is a wonderful feeling. It inspires confidence in your abilities and work ethic and leads to less stress during your recreation time. But what happens when your use of social media disrupts that productivity leaving you wondering how the workday got away from you? Development of corporate policy regarding social media is still in its infancy with some companies implementing the technology into daily operations while some ban its use outright. But most companies accept it, if not with open arms, with toleration of its ubiquity. This frequently leaves employees the freedom to set their own social media boundaries, leaving them free to potentially abuse their privilege. So how can you ensure you are using social media responsibly? Here are some general guidelines to help you stay productive while still scratching your social media itch. 1. Even with the slow realization that companies cannot possibly enforce rules to ban social media usage in the workplace, most employers have implemented policy to govern how it can be used. Even if you are allowed to post at your whim, there are always unspoken rules of etiquette that must be followed to avoid rocking the boat. Make sure that you are very aware of any policies your company may have regarding social media and respect them. If there are no formal rules, observe the general attitude toward social media usage displayed by your managers and co-workers and follow those. The more conformist you are on this issue the less likely you are to create tension. 2. It should go without saying that, whether at work or play, discretion with social media postings are essential. Even if your company is laissez faire about its usage, that doesn’t give license to post just anything. Social media is inherently public and you never know who could be monitoring your activities. The watchword here is “protect your business.” Don’t allow your emotions to cause you to share compromising information or show your disdain for a client. Especially if you work in a field where confidential information is commonly shared internally, take precautions with your social media behaviors. 3. Taking a brief break from your work to respond to a post comment or shoot a quick tweet can benefit you by reducing your stress level and help you mentally reset, but social media is well known to pull users in for big blocks of time dedicated to “liking” videos, chatting, and sharing news stories. When you feel the temptation to lose yourself to Facebook for an hour or two, remember that you could be jeopardizing your productivity and professional reputation. Unnecessary social media activity should be limited to lunch breaks or other times when you are off the clock. Your tweets and cat videos will still be there once you’ve gotten your work done. Practice self-discipline! 4. Recognize that social media can be more valuable than simply sharing trivial bits of entertainment or sharing the minutia of your daily life. And in some industries, it can even offer substantial benefits to your job if used appropriately. Use your social media privileges for work-related tasks such as troubleshooting, sharing ideas, reaching out to candidates, and marketing new products. 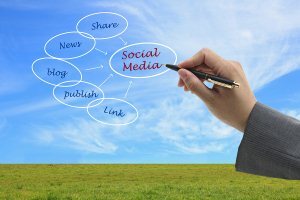 Showing that social media can actually benefit your business can help make it more acceptable in professional situations in general. Being responsible with social media usage at work is simply a matter of being savvy and self-disciplined. Always follow the rules your company has in place regarding the issue, both spoken and unspoken, be discreet about what you say and who you say it to, don’t abuse an open social media policy, and look for ways to add value to your work through the technology. The more you know, the better you can help keep social media in the workplace cast in a positive light.